In Christian symbolism, the rose is closely associated with the Mystery of the Nativity, and therefore with both Jesus Christ and Mary. The idea of the perfect flower, springing forth from a thorny stem, has – like the Nativity itself – captured the imagination of poets and musicians throughout the ages and from all stations of life. 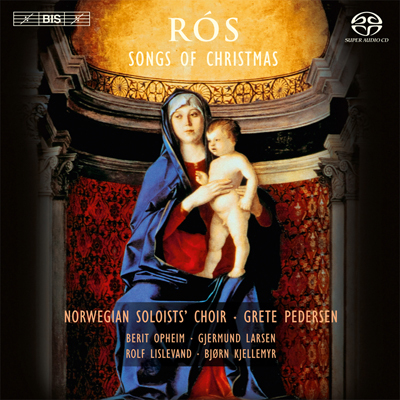 With this original and wide-ranging Christmas collection, Grete Pedersen – the artistic director of the Norwegian Soloists’ Choir – has created what might be compared to a rosary, combining 12th-century hymns by Hildegard of Bingen with a carol by the Danish 20th-century composer Per Nørgård, as well as traditional Christmas psalms, in many cases sung to Norwegian folk tunes following age-old usages. Grete Pedersen and the choir have reached a wide international audience through four previous discs on BIS, ranging from collections of Grieg, or of Brahms and Schubert, to the folk-inspired White Night and, most recently, Refractions: the unexpected combination of three 20th-century giants – Berg, Webern and Messiaen – with their Norwegian contemporary Fartein Valen. On the present disc, the team is once again joined by the singer Berit Opheim and the violinist Gjermund Larsen – both with a background in folk music – as well as by Rolf Lislevand, internationally acclaimed lutenist, and the highly respected jazz bassist Bjørn Kjellemyr.